A startling thing happened during all these experiments: after I dialed everything in using first order crossovers and tweaked the delays to smooth the phases out (and also rotated the K-402s down to the same height above floor level and slightly in front of the bass bins--47" to the horn throat centerline from the floor, and about 7-8 inches in front of the bass bins with the K-402 mouth slightly overlapping the top of the bass bin mouths), I suddenly heard a sound that held my attention and caused me to stop and just listen--to entire albums of music. This is a really weird effect (that I don't intend to change). I rotated through many of my now-standard recordings that I use for assessing the changes in sound that I've made, and found that every album sounded much more "in the room" and engaging/listenable and alive with the feeling of the musicians playing in the room. I know that these terms are often overused on the forums, but in this case, there was no other explanation other than "wow, it suddenly sounds so different that I don't want to turn the current track off". The problem is...I can't describe this effect very well. I have tried to use the phrase "it just sounds more together", but that description really doesn't really do it justice. It's an effect that's so subtle that I can't really objectively describe it (as in a blind A-B test: ABX), but it was so apparent that even my wife stopped and just listened while she was passing through the area. So it's a real effect, but it can't be described very easily. It works at high and low SPL, at off-axis angles, and with most genres of music on both good and poorly done albums. The fact that it can't really be described easily in words is a real problem, I believe. So...I went through some Google keyword searches until I found the article that I linked at the top of this thread. The name of the article is "The Possibility of Subconscious Auditory Effects in Audioworkers - A Case for Renewing Humility and Wonder in the Field of Professional Audio" by Allen Farmelo. The article has apparently just now hit the street in terms of references from other sites within the past week or so, even though it was dated from 5 years ago. So the bottom line: could it really be that much of the ABX arguments on audiophile websites is confounded (in the six-sigma sense of the term) with the difference between objectively describable sound stage/imaging/micro-detail language, and a subconscious change in sound that hits you, but you just can't find the words that describe it? When you do the knee-jerk reaction, you say to yourself "sure that happens--all the time", but when you think for a moment longer, that answer is not one that you want to acknowledge happens. The reasons will probably become more apparent as we discuss this phenomenon a bit more. It means, in effect, that you can't use words to describe that last 1% or even 5%--but that means the difference between channel surfing through music tracks constantly, and sitting through whole albums, and perhaps even the entirety of all the albums of a certain genre in your music library. Essentially what we assert as a[n audio worker] community--is that the only Subconscious Auditory Effects [SAEs] that really matter are those that fall within the narrow bandwidth between what regular people can’t hear and what we experts can. If this is true (as I now firmly believe it is--since my experiments using 1st order crossover filters and very carefully chosen delays), then as we progress further into the last 5% of sound reproduction performance, we can't describe what we're hearing. Furthermore and most troublingly, it's that last 5% or 1% of performance that makes all the difference in the world in terms of listener engagement-stuff that can't be put into words but that pull us into the playback experience. If this is the case, then us engineers in the crowd have a bit more difficult time building sound reproduction systems. Now I know that you're probably thinking, "where's he been all these years--his head in a hole?" It may turn out that's correct, but I'd wager that this particular event that I'm describing is not really the case of "been there, done that". This experience was a first (for me) and it only occurred after many years of assembling the right setup: bi-amped Jubilees & Cornwall/AMT-1s, tri-amped MEH, etc., using DSP crossovers, a lot of measurements, experimentation, and finally, a lot of fine tuning. This isn't like "tube amplifier magic" or "synergistic coupling of gear" stories . It was simply turning the crank while having the right tools to achieve the results that just appeared, suddenly. So let me state again what's caused me to write all this: after a lot of work, a new plateau of audio performance suddenly appeared, but that last 1% of performance tweaking made more than 50% of the difference in subjective listening performance and it can't really be described in words what that difference really sounds like. Now if that statement true, that creates real problems for those that want to be able to quantify the differences using descriptive language--like people writing on forums like this one. It also means that as we progress toward even higher levels of audio reproduction performance, ABX testing is not going to work very well to describe what works better and what doesn't, and being able to quantify how much better it is. We're describing a very non-linear scale of how much one improves their sound system performance and the resulting value of that sound system to the listener. That scale doesn't really get steep until we reach the last 1%-5% of performance. This situation isn't a very good one from the standpoint of marketing loudspeakers or other audio gear, or even trying to communicate on a forum like this one. But the difference is like night and day in my experience. 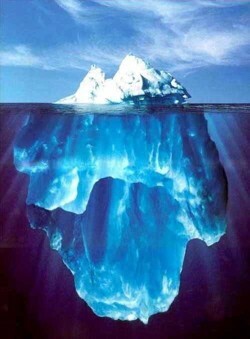 It also illustrates a problem that is difficult to convey on forums. First, you've got to find someone that's heard the difference before you can talk to them about the phenomenon that occurs. The aim of the thread is about one subject: audio reproduction changes having large subjective effect on listeners, but that the listeners and the people working in the technical music production chain cannot really describe the end effect accurately (...as some might try to verbalize anyway...) The linked article above was provided as a reference only to the existence of this effect--a subject that is apparently not very widely discussed to date. I would guess that most people are listening to audio reproduction systems that completely cover (hide) these effects--that have all manner of defects in their reproduction characteristics. It's been relatively recently that very high fidelity sound reproduction, including but not limited to near-minimum-phase loudspeakers having little or no reproduction artifacts, have appeared and that are economically feasible for your average hi-fi aficionado. These setups are enabled via DSP crossovers that have become powerful and inexpensive, as well as in-room acoustic measurement tools (applications, computers, calibrated microphones). And all that for less than $1K or less. It's democratized audio reproduction--just like full motion pictures being shot by amateurs and film students using Canon 1Ds and other full-frame DSLRs having 1080i resolution or better. While the democratization of near-perfect audio reproduction (relatively speaking to what we've had in the past) is an interesting subject in itself, that isn't the subject of this thread. Large subjective changes in audio reproduction perception is the subject. "The results of these tests showed clearly that the addition of the excess phase equalizer had an effect on the perceived sound, albeit a very subtle one. However the nature of the distortion mechanisms and type of program material bring into question the basis of the perceived differences. It is the authors' (and it is with much trepidation that they put it in writing) belief that, based on the results obtained here, in a stereo system with good quality equipment the apparent differences are perceived phase changes rather than amplitude deviations brought about by loudspeaker nonlinearities. This view is arrived at from two different sources: firstly when measured by both white noise and impulse techniques, which are very different signals, the measured amplitude response remains the same regardless of the phase equaliser; secondly the nature of the apparent change seems inconsistent with nonlinearity school of thought. If there was a tonal difference or some other ambiguous difference then this could be put down to nonlinear distortion, however the general opinion was that it was the apparent sound stage that was modified, which the authors' cannot justify by this approach. ...However one can envisage the situation where the entire recording through to reproduction chain remains phase linear, in which case the results obtained here suggest the phase response of loudspeaker systems is of importance. With digital processors becoming widely available and ever more powerful a single equalisation scheme from microphone through to disc is not unrealisable, and indeed most desirable. With this scenario, a similar equalisation scheme for the complete reproduction system, from disc through to loudspeaker, must be greatly advocated. Then it occurred to me: all of JBL's loudspeakers have directivity issues below 800 Hz, which is precisely where all the improvements in phase/group delay of the above plots occur (the red trace is first order filters and adjusted delays to yield smooth phase/group delay, while the green trace older measurement is the nominal 4th order Linkwitz-Riley filters with carefully chosen HF delay to minimize group delay). No wonder why Toole covered his tracks in his book and online on the AVS forum--he never acknowledges the contributions of directivity control below 500-800 Hz and smoothing the phase/group delay found there. Perhaps this is why the JBL M2 Studio Monitors lost their shoot out with the Revel Salon 2 on the same AVS forum...because the M2s lose directivity below ~800 Hz due to their direct radiating vented bass bins. Repeating what I said earlier: even though I couldn't put into words the differences in sound using the lower order crossover filters, I can say that it was unmistakable that there was a dramatic change in the sound of the Jubs when these changes were made. My aim is to begin to generalize the approach mentioned above and that was used in the Jubilee crossover filters and delays, which was originally developed for setting the K-402-MEH prototype serving as my center loudspeaker. I have since applied this approach to setting crossover filter values for the AMT-1/Cornwall bass bin, and then the present AMT-1/Belle bass bin configuration that I'm currently using for surrounds in my 5.1 array (two DIY SPUD horn-loaded subs in the front corners of the room). The use of first order crossover filters was first recognized while examining the black box response of a Danley SH-50, whose phase response using passive crossovers has been noted for producing the most outstanding stereo reproduction heard by many reviewers in their home hi-fi setups. After some tinkering, I found that a DSP crossover using IIR filters can replicate and slightly beat the phase and group delay response of an SH-50 using different loudspeaker configurations--including Jubs. Since December, I've been applying the same techniques to dialing in other Jubs and other types of loudspeakers for those seeking help via email and forum PMs. I've lost count how many people that I've helped this far, and sometimes I find myself helping to dial in as many as three setups per week. I'm currently having trouble keeping all the setups straight from one another. I have noticed that the imaging is getting better, and the sound stage is becoming bigger and deeper, sound quality has improved by about 40%-50% since you started helping me with the DSP settings. And the latest round where he reported the dramatic listening differences (we're still dialing it in further). "After doing some listening I think I like the 1st Order...file the best so far." 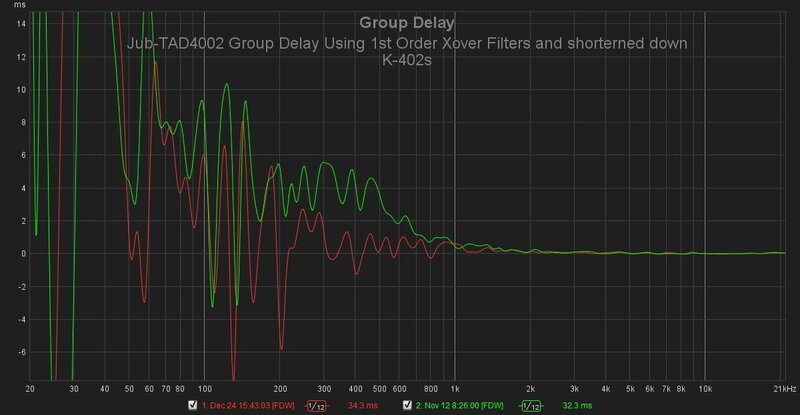 I've found that first order crossover filters actually smooth or broaden the irregular responses in the crossover interference bands. The tradeoff of course is wider interference bands--as has been tacitly assumed to be more important to minimize in the past. Conversely, I've found that the width of the interference bands is actually at a much lower precedence than minimizing phase growth through the crossover regions. That is the subject of this thread--subconscious or subjective listening differences via minimization of crossover filter-induced phase growth/irregularities (phase distortion). By the way, the notion of using first order crossover filters came from John Atkinson's interview with John Dunlavy on Stereophile's web site. I gave his approach a try, and the results were startling--probably even more so than in Dunlavy's listening room, because the Jubs have better lower midrange and low midbass directivity, and by extension, presents a cleaner direct-vs.-reflected energy balance in which to hear the effects of phase flattening. It's also interesting to note that most of PWK's crossovers used first order filters, and that he said that they "sounded better to him". That was actually the cause of doing my experiments, which I've chosen to share in this thread with others having K-402-based loudspeakers so that they might try it for themselves. With DSP crossovers, all it takes is a little time--as it costs nothing to try it. 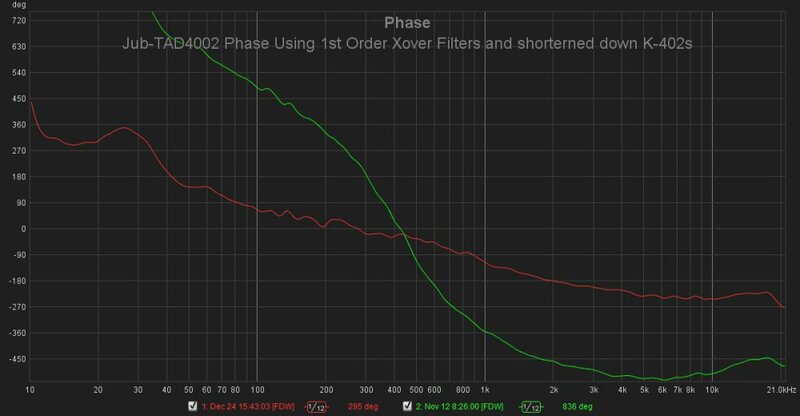 Besides switching the crossover filters to first order (and raising the crossover frequency about 100 Hz to partially compensate for the shallower slope on the bottom end of the compression driver frequency response), one must reduce the delay on the HF channel to account for the lower phase growth (90 degrees) of the first order filters relative to higher order filters. I also found this same effect as I was measuring the response and crossover networks on a Danley SH-50. Danley mentioned that they didn't use "named" crossover filters (i.e., Butterworth, Bessel, Linkwitz-Riley, Chebyshev, etc.) in their Synergy series. He was absolutely right. And the results spoke for themselves. Klipsch was using first order filters in most of their loudspeakers until PWK took partial retirement in the 1980s. I believe this is a significant part of the "Klipsch sound" that has been talked about so much. When you look at the Danley SH-50 crossovers, you have a 6 dB/octave high-pass slope on the midrange, but no apparent filters at all on the midrange low pass, plus there is attenuation. The woofer looks to have only notch filtering at ~160 Hz and a low pass of first order above 250 Hz. The tweeter has a really deep-and-wide notch filter centered at 2.68 kHz [EDIT: actually three big notch filters: one each at 1.4, 2.8 and 6.1 kHz with attenuating gains of -15.75 dB, -10.25 dB, and -8.25 dB, respectively...and bandwidths of about 0.5 octave] but no apparent high pass filter evident in the frequency response. All three channels have fusing on board their extensive crossover boards. The combined response of the three channels is basically "a work of art" (i.e., not a clean monotonically decreasing downward slope between driver channels). I'm not really sure why Danley did it that way--but I suspect that arrayability of loudspeakers played a disproportionate role, as well as a requirement for extremely flat phase response and super high SPL output capability. Those are not home hi-fi requirements-except for the phase flatness one...in retrospect. It's actually fairly shocking how little frequency response that the four midranges provide in the SH-50...about one octave only, and the resulting frequency response contribution of the midranges is decidedly not flat within that octave. I read through much of what you posted Chris, and frankly much of it is beyond me. If you boil your subjects down, it looks to me like the discussion would center around a person's ability to verbalize what is essentially a non-verbal emotional reaction to audio. Since this thread is in the "Technical" subforum, I have taken that privilege to post on a topic that may be a little more advanced. But I hear you. I recommend asking specific questions on topic areas that are too fuzzy. You might also get the gist of the arguments without fully understanding all of the supporting material that I've included. I recommend hitting the high points first, and perhaps coming back and scanning those sections again that were difficult to follow on first read. You can basically ignore the TapeOp article without any real loss in core information. That article was included only as a reference to the relative lack of awareness of the effects mentioned in this thread--flat phase and subconscious effects of hi-fi. But I hear you. I recommend asking specific questions on topic areas that are too fuzzy. I was very specific but I'll try again using both sides of the question. Does this topic deal with the PROBLEM of perceived auditory phenomenon that can't be described as, you said? The problem is...I can't describe this effect very well. but it can't be described. Are you dealing with the specifics of dialing in a Jub which uses a TAD? I recommend reading it as if you were reading a "think piece" or more like a magazine article instead of a sound bite (that so many people are apparently used to reading nowadays). There are things in audio reproduction that are difficult to hear and describe easily, but that make a lot of difference in how it holds our attention--a very nonlinear scale of performance/satisfaction. When using very high fidelity horn-loaded loudspeakers having almost full-range directivity (K-402s on top of horn-loaded bass bins, or alternatively full-range MEHs), you can hear phase distortions much more clearly, especially in rooms that have been treated to control early reflections. (This part isn't really found above): If you own loudspeakers not having full-range directivity (like the JBL M2, etc. with direct radiating bass), having much improved phase fidelity isn't going to be audible, and the magic of flat-phase fully horn-loaded loudspeakers in acoustically treated rooms will probably not be present (unless huge amounts of absorption is used to control frequencies down to 100-200 Hz). It's entirely up to the reader to decide if what I've posted above is worth their time to absorb. It took the author a while to discover all this and then to assemble the elements and write about it. If it takes readers more than 90 seconds to read it all, that's probably not a big surprise. I see this as tying into the same idea as your de-mastering. You are aiming for flat phase throughout your playback system, the same as getting the eq and phase correct on your recordings (which have been messed up due to extreme eq adjustments, multiband compression, etc., during the mastering process). I see the similarities between the two as you describe it. Would this be a correct, even if rudimentary understanding? What, you're not an exceptional "typist"? Those first few (long-ish) posts were submitted mere minutes apart! I follow you precisely, by the way. Good stuff. Well, I could take credit for typing that fast, but remember what I wrote in the first sentence of this thread: I copied those posts from another thread. So my error (I suppose ) is that I didn't update them faster than the first poster in the thread to be mutually consistent without the intervening posts from the original thread by people other than myself. Sorry about that--I'm not THAT fast. Thanks. It's nice to hear from time to time. Absolutely. Thanks, Bruce. Not rudimentary but actually extremely insightful. I.e., tying those few really hi-fi recordings whose originating phase relationships are perhaps largely still intact to flat frequency response and flat phase (i.e., non-multi-track recordings), then reproduced by loudspeakers having flat frequency response and flat phase (if the frequency response of the loudspeakers isn't absolutely flat, then the phase is also then messed up--because loudspeakers are minimum phase devices) and having very good directivity that keeps the early room reflections minimized, and into a listening room that doesn't immediately mess up those phase relationships by adding nearfield early reflections before it can reach the listener's ears. 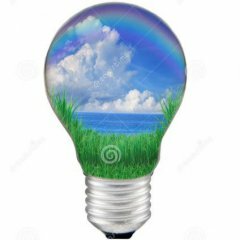 These are simple concepts for those that have been exposed to them in advance of this thread. But not so much for those folks that are being exposed to them for the first time in this thread. That makes the thread a bit more than a 60-second sound bite, unfortunately. A lot of people say: "well, I don't listen to music that has that level of fidelity". Okay, so you don't. But I do. I like my music with as high fidelity as I can get it--even if that means I have to undo some of the damage done during mastering (but I can't fix mixing issues) via undoing the "translation EQ" and perhaps a few other things--which opens up a lot of recordings for higher fidelity reproduction. So I do demastering--and I've written about how to do it in a thread on this site. Same thing for doing measurements using a calibrated microphone and REW, dialing in loudspeakers (PEQs, delays, etc.) and rooms with DSP crossovers, and acoustically treating my room to control early reflections. Well...there it is: the concept is actually pretty straightforward...just not often found on these web pages. It's also interesting to note that most of PWK's crossovers used first order filters, and that he said that they "sounded better to him". It was also Bruce Edgar's conclusion for his Titan horn setup after many listeners agreed with him. When I had B&C on DE-250's, on QSC horns, and K-1133's on K-402's on top of my Quarter Pies, I only used a single capacitor on the mid and tweet drivers, since the mid/tweet section was sensitivity matched (by design), but I had active on the Qpie bass horn. It was a very good sounding "hybrid" solution at the time, about 7 years ago.